Identification: This species can vary in pattern but can usually be identified by its translucent body with a white median line that bifurcates midway along the notum to form a "Y" that circles around the gills. Another white line forms a loop around the median line. There is a marginal orange band and the notum is decorusted with large purple spots. Mantle glands can often be seen around the margin beneath the orange border. The rhinophores and gills are cream. 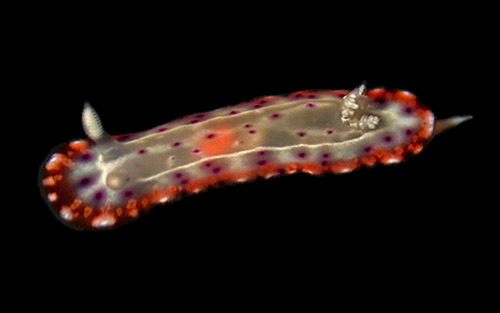 Natural history: Goniobranchus decorus is a common species although it is seldom seen due to its small size and nocturnal habits. It may be found in tide pools and from the low intertidal to 10 m (32 ft) on protected to exposed rocky bottoms. Scott Johnson reports it feeding on a jet black sponge in Hawaii (pers. com.). However, it's also been reported feeding on several other species and may be feeding on the translucent brown sponge in the "in situ" photo. Its egg mass is pale orange and each egg is associated with a small cap of dark orange extra-capsular yolk. Distribution: Big Island, Maui, Oahu, Kauai, French Frigate Shoals and Kure: widely distributed in the western and central Pacific. Taxonomic notes: This species is listed as Chromodoris decora and referred to as the "decorated nudibranch" in Hoover, 1998 & 2006. It's also listed as C. decora in Bertsch & Johnson, 1981, Kay, 1979 and Kay & Young, 1969. It was first reported from Hawaii in Pease, 1860 (as Doris decora). The name means "pleasing." Photo: PF: 11 mm: found by CP; Napili Bay, Maui; May 6, 1993.